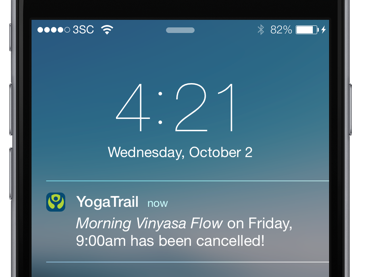 YogaTrail empowers you to reliably communicate with your students, keeping all your yogis informed about your classes, upcoming events and happenings. Making it as a teacher or studio is not about attracting new clients all the time. Think about it for a moment: people usually aren't really looking for a new teacher or studio (unless they're traveling or totally new to yoga). The vast majority of yogis in your classes are people you've seen before, and most of your business comes from your existing clients. That means that keeping your students informed about your class schedule, upcoming events, your availability for privates, and your general updates... it's key to getting people coming to class or signing up for a workshop. And it's what YogaTrail can help with. When you add your yogis to your 'Students' dashboard, they'll get an invite to follow your profile and subscribe to your classes and updates. When you cancel class, assign a substitute, or take a break for a while... all your students are updated automatically (with your permission, of course). You can also send custom messages to all your students (like announcements or questions) and engage your community much better than you can on social media. When I upload my client list to YogaTrail, is it safe? Yes, absolutely — your students are yours, and yours alone. YogaTrail will never share their information (especially their email address) with anyone. Also, just FYI: when people with whom you have no previous connection choose to follow your profile, they become your students and are added to your list. Will my students get spammed or overwhelmed with emails? Spammed: certainly not! YogaTrail is careful about sending emails and not annoying people, too. After signing up, a yogi gets a "welcome" email and 2 other "how to get the most out of YogaTrail" emails (spaced a few days apart). There's also a weekly newsletter that sends on Wednesdays which contains local yoga happenings, a summary of what's new in their yoga world, and usually a cute story (yoga related) — but people can manage their email preferences and easily unsubscribe from such things. The majority of email or notifications reaching your yogis will come from you, and you are in control. For example, if you post a new upcoming event or cancel class, there's always a "notify yogis" checkbox you can leave unchecked, so no notification is sent. Won't my students discover the competition? Indeed: YogaTrail is a yoga network, so your students can discover other teacher and studios, and might even follow them. But it works both ways: other local yogis will discover your profile, too. But the real truth is that your students have absolutely no trouble finding "the competition", with or without YogaTrail. If you're a teacher, know this: your yogis come to you for instruction because they love what you do, what you know, and how you make them feel — not because they can't find another yoga teacher. Similarly, if you manage a studio: people will like a studio and become loyal clients for all sorts of reasons... but "not knowing about any other yoga studios" is not one of them. There's a different yoga studio on every street in some places! We sincerely hope that you don't view other yoga providers merely as "the competition" or threats to your business. Things don't work that way in the yoga market. While a person might buy a toothbrush from any nearby shop nearby, they're quite picky about their yoga. The yoga community is extremely diverse, but we're all in this together. When I add students to my dashboard, how are they invited? Will they get spammed? When you add students on your dashboard, they'll get an email on your behalf to confirm that they are your student and inviting them to activate their YogaTrail account. If they don't do anything, they might get up to 2 "reminder" emails, spaced several days apart. That's it. They won't get any other emails from YogaTrail, since they most likely are simply not interested in joining the YogaTrail platform. They are also not subscribed to any newsletters, and their email address will not be shared with anyone else or with any other company.